An extract from Quarlton by JJ Francis, pages 20-27. 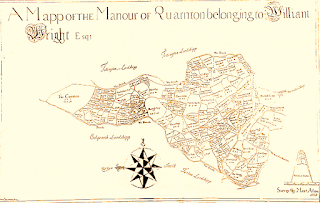 A few years after the purchase of the Quarlton Manor, William Wright had a plan of the estate drawn up by Matts. Aston in 1727. This is similar in detail to the Barton 1620 map but unfortunately no tenants are named apart from the two directly held farms of Barons and Meadowcrofts which were held by Thomas Entwistle and Mr Meadowcroft respectively. The land to the east in Tottington Lower End Township is no longer within the Wright estate and it would appear that at the time of sale this section was taken over by the Knowles family to add to their Hawkshaw Farm which in the 1794 Survey is owned by Andrew and Robert Knowles. William Wright’s Quarlton Estate Plan of 1727. The roads were by now better defined with the Affetside to Edgworth road taking the now familiar route via Knotts brow. What later became Old Ben Lane is shown running from the top of Knotts brow up to Old Heyes with a branch to Quarlton Fold. There are some fields with the same name as they had a hundred years previously but quite a number of the larger fields are split up into smaller areas, an example being Longshaw Head Farm. On the 1620 map the previous large single field now forms six smaller closes. 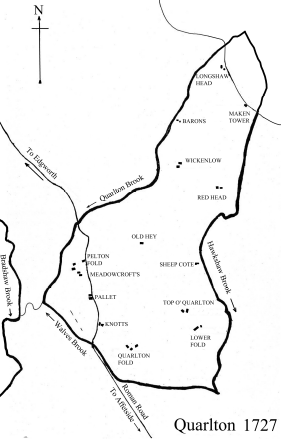 This division is associated with additional farmsteads; in 1727 Sheepcote is now formed to the east of Top o' Quarlton, with Old Heyes in the centre, Red Head or Red Earth in the north-east and Longshaw Head in the north, adjacent to the lane we now know as Moor Bottom Road, and a neighbour of the older Maken Tower - over the years referred to as Morgan Tower or Manken Tower and perhaps named after the Makin family who lived at Wickenlow in 1740. The first indication of coal mining is noted by the names of three fields to the west of Top of Quarlton called 'Great Cole Pit Field', 'Long Cole Pit Field' and 'Little Cole Pit Field'. This is near the area where the Upper Mountain Mine seam outcropped and the coal might be worked simply by digging out. The seam slopes from west to east at an angle of approximately 20% so that after digging out as deep as practicable, shafts would need to be sunk to get to the coal bed that was dipping steeper than the slope of the natural ground. At these deeper levels drainage soughs (or tunnels) would be required to remove water from the workings. There are also two fields north-west of Wickenlow called 'Little Pit Field' and 'Great Pit Field' but we have no record of coal mining in this locality and they might signify the quarrying of stone. There is also a 'Stone Pit Field' south of Lowerfold; all the necessary building stone would undoubtedly be quarried locally. The large common area to the north is still noted, presumably for the use of tenants and freeholders. Quarlton Farms marked on William Wright's Map of 1727. The Knowles', one of the leading families in Quarlton, were first recorded in Edgworth and their first residence in Quarlton was by Richard Knowles, who was buried in the Bolton Parish Church on 14th September 1590 and Alexander Knowles, buried there on 7th September 1619. Only the influential or wealthy were buried in the interior of the church rather than the grave-yard. Richard, son of the above Richard, was at Top of Quarlton in the 1620 plan, whilst the Thomas Knowles, at Lowerfold in 1620, was probably Richard's cousin. Members of the Knowles' family farmed at Top of Quarlton, Lowerfold, Maken Tower, Longshaw Head, Wickenlow and at Hawkshaw Farm at various times up to the mid-1800s, as well as working as drovers and chapmen. There are a few Wills of the Knowles family that give an insight to their standing in the 1700s. John Knowles of Quarlton who died 9th May, 1727 left an estate worth £65-11s-6d, including hay, plough and irons but only one horse and two beasts. His furniture suggests a high level of comfort for the time and even included a clock. As he left £70 to each of his sons in law, James Orrell of Edgworth and James Wood of Turton, to satisfy marriage contracts, it rather looks as if those bequests were settled before the appraisal. We do not know where John lived but his goods suggest one of the larger farms. Another Will dated 10th November 1765, is that of Mary Knowles, widow of Thomas Knowles, late of Quarlton, who had been a chapman: they were the traders or merchants who bought and sold yarn and woven cloth from the domestic workplace to sell in the markets of Bolton and Manchester. They had the lease of Maken Tower (Moor Bottom Road) from William Wright; son John Knowles was amongst family beneficiaries. The Knowles family emerge as the entrepreneurs of the area and by this time are well established farmers or chapmen. An interesting marriage registration at Bolton Parish Church details James Knowles, who married Elizabeth Haslam of Harwood on 17th May 1740, and is described as a drover or chapman. He was buried at Turton, 11th June 1779. Quarlton residents having no Chapel of Ease used the Parish Church of Bolton for baptism, marriage and burial, although Turton was used for burials from the mid-1700s. Some marriages and baptisms were also officiated at Bradshaw and Turton Chapel as on November 20th 1664, when the marriage of Peter Bromiley of Turton and Ann Butler of Quarlton was officiated at Bradshaw Chapel by Robert Harpur, the then Vicar of Bolton. Some baptisms and marriages were also solemnised at Holcombe Chapel. Although the Knowles’ lived at Top of Quarlton during this period, in common with other Quarlton messuages, there were two separate farmsteads. The second one here was probably linked to the barn at the north-east of the main building. On top of the wall adjacent to this barn is a carved date of 1629. 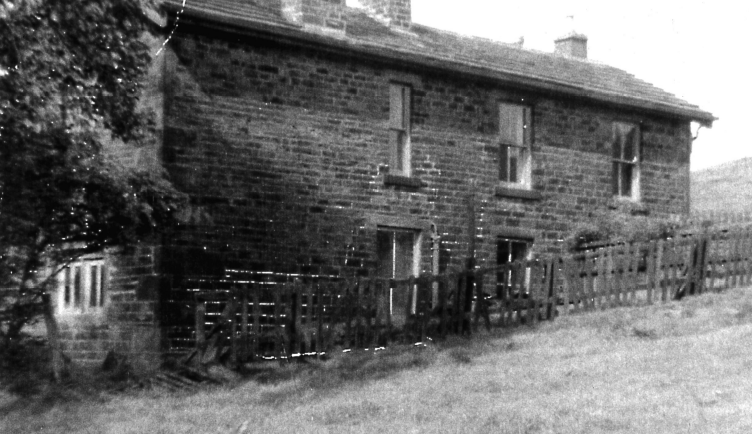 In the early 1700s this farm was tenanted by the Longworth family from Entwistle. Thomas Longworth died at Quarlton on 11th March, 1759 and was buried at Turton leaving an outstanding lease of 14 years to run on his Top o' Quarlton farm. Son John continued to run the farm until 21st June 1773 when he hanged himself in his own barn at Top of Quarlton. The report in the 'Manchester Mercury' says he rose that day at 5 o'clock and was seen by his neighbour looking at his corn crop. The Coroner could not account for his death because John Longworth was 'in good circumstances' and the suicide was put down to lunacy. It is felt within the present Longworth family that with the lease running out that year, requiring a substantial payment for renewal, John Longworth may have feared eviction if there was insufficient time for the corn to ripen and sell before the lease ran out. In the event, John's uncle, Ralph Longworth from nearby Redisher helped out the widow. Wickenlow was another location which probably included two families in the 1700s shown from baptism records at Holcombe Chapel. In 1733 Robert, son of Richard Makin of 'Whickenlow' was baptised 10th February 1741, their daughter Betty was baptised 20th August of the same year, and early in 1742 James, son of Christopher Isherwood of 'Whickenlow' was also baptised. Another Holcombe Chapel baptism was that of Ellen, daughter of John Haslam of Maken Tower on 25th November 1739. Mr Meadowcroft, who gave his name to Meadowcrofts, sold this property to Richard Orrell in the late 1700s who in his Will of 1799 left the house to his son Thomas. There were two date-stones, 1620 TMO, M signifying Meadowcroft. and 1745, ACD, possibly denoting Alexander Chadwick and his wife. Of the other section of free land, Barons, we have more documentary evidence of change. Thomas Warburton of Stubbings, gent, sold the property to Lawrence Horrocks of Edgworth, yeoman, on the 24th May 1649, when it was described as late in the tenure of William Baron of Quarlton: from then on this property was known as Barons. On 2nd April 1674, Lawrence Horrocks sold Barons to William Entwistle of Quarlton, husbandman. William died 3rd May 1727 bequeathing Barons to his grandson, John Entwistle of Quarlton. The Wright map of 1727 puts Barons down to Thomas Entwistle who was at this time executor of William's Will. Included with the executors is John Entwistle of Edgworth but late of Longshaw Head. The day John Entwistle acquired Barons under his grandfather's Will, he sold it to Andrew Knowles of Edgworth, yeoman. On Andrew Knowles' death his executors sold Barons to John Bury of Quarlton, yeoman, on 3rd July 1746, who himself died on 4th January 1768 leaving his estate to his grandson George, subject to charges to his grand-daughter Ann. A contemporary document describes Barons as 'consisting of two cottages or dwelling houses, one barn, one shippon and enclosures called Field above the house, the Clough, the Furthermost Field, Further Meadow, Meadow under the House and Meadow at the Clough, in all 4 acres’ (8.6 statute acres). On 2nd June 1777 Barons ownership was confirmed to Henry Entwistle of Edgworth, yeoman and Ann his wife, grand-daughter of John Bury.